​​First, let us explain HOW IT WORKS, the FRAMEWORK WE APPLY and then show BEST PRACTICES on how we apply behavioural incentives. ​​We reward your players along the narrative of your game - we call it the gamer’s journey. Rewards are real-life goods like your own game merchandise (don't worry, we'll set everything up for you), gift cards and brand sponsored rewards that can be unlocked, redeemed or purchased without leaving the game. As a result, we increase retention and boost the CLTV of your paying customers. You can learn more about ​+ What is Monetizr​ here. 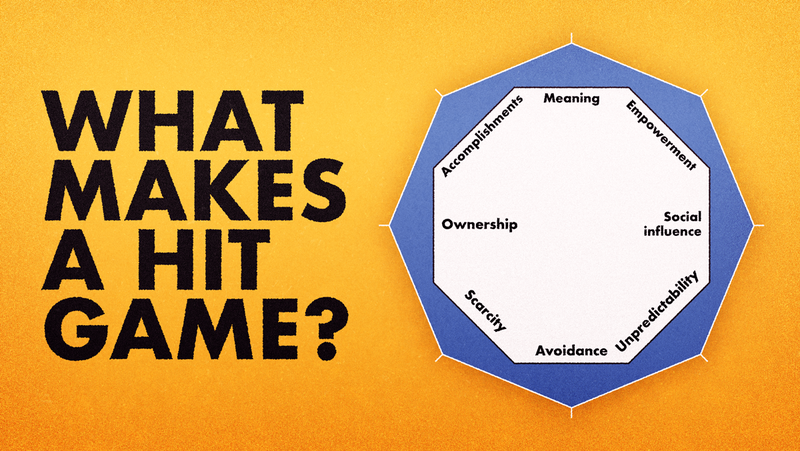 ​​​❓​What is this gamification framework? ​​For those new to the game, Octalysis is gamification framework that defines 8 core drives behind human motivation. The system was designed by Yu-kai Chou after a 10-year long research, and it has already favorably impacted more than 1 billion user experiences around the world. Read more on our Medium blog. Can Octalysis Predict Success in the Gaming Industry? ​​Read more on our Medium blog. ​​Now let us show you best practices on how we apply behavioral incentives for our customers through the lens of Octalysis. We're applying all 8 core-drives to reward gamers. ​​This core-drive motivates players because they are doing something greater than themselves, or they were “chosen” to do something. ​​A player who devotes a lot of time to maintaining a community, a forum or is helping to create value for others (think Wikipedia or Open Source projects). ​​Motivational drivers: Narrative, Elitism, Humanity hero, Revealed heart, Beginners luck, Destiny child, Creationist, a.o. ​​Coca-Cola will match every dollar donated to game developer with $10 amount donated to “Water for People”. ​​A core-drive that sees the player desiring to learn more in order to overcome challenges, make progress, develop skills, and eventually - overcome challenges. The word “challenge” here is very important, because giving out badges or trophies without a challenge is not meaningful at all. ​​Development & Accomplishment s are one of the easiest to design for points, badges and leaderboards. ​​Motivational drivers: Status points, Badges, Achievement symbols, Fixed action rewards, Earned points, Leaderboard, Progress bar, Quest list, Dessert oasis, High five, Crowding, Anticipation parade, Aura effect, Step-by-step overlay tutorial, Boss fights, a.o. ​​Hatch-it is a puzzle game where a little robot has to hatch dinosaur eggs in order to save them from falling asteroids. Merch items are unlocked throughout the game, saving exclusive swag and bigger discounts for higher achievements. The more the user plays, the higher exclusivity product and discount he/she gets. At the final level called “winter”, the user can unlock really rare, one-of-a kind items. ​​Core-drive that sees when users are engaged in a creative process where they have to repeatedly figure things out and try different combinations. Players need to express their creativity and see results, receive feedback, and respond in turn. ​​This is why playing with Legos and painting is fun in-and-of itself and often becomes Evergreen Mechanics, where a game-designer no longer needs to continuously add more content to keep the game fresh and engaging. ​​Motivational drivers: milestone unlocks, real-time control, evergreen combos, instant feedback, boosters, blank fills, plant pickers, poison pickers, a.o. ​​Slopes is an app for tracking skiing and snowboarding activities. It uses smart recording functions, works without wi-fi or even cellular service and activities can be easily shared with friends and family. By skiing and/or snowboarding, players earn the right/opportunity to buy limited edition branded swag. Every ride unlocks a new level and new merchandise.